The Nationwide Children’s Hospital Championship on the Web.com Tour tees off Thursday on the Scarlet Golf Course at The Ohio State University, a layout redesigned in 2006 by proud Buckeye and Columbus native Jack Nicklaus. The field is comprised of a mix of players who finished 126–200 on the PGA Tour’s FedEx Cup points list, and those within the Web.com Tour’s top-75 money winners. The event is the third of four Web.com Tour Finals events—and one of two played on a Nicklaus-designed course—helping to determine who will earn PGA TOUR membership for the 2014–2015 season. Fans can watch the action on the Golf Channel Thursday through Saturday from 6:30 p.m. to 8:30 p.m. ET, and Sunday from 4:00 p.m. to 7:00 p.m. ET. As “The Path to the PGA Tour,” the Web.com Tour awards 50 PGA Tour cards for the upcoming season. Twenty-five cards will be awarded to those players who earn the most cumulative money in the four-event Finals. Previously, an additional 25 cards were awarded to the top-25 money winners during the 21-event Web.com Tour Regular Season. 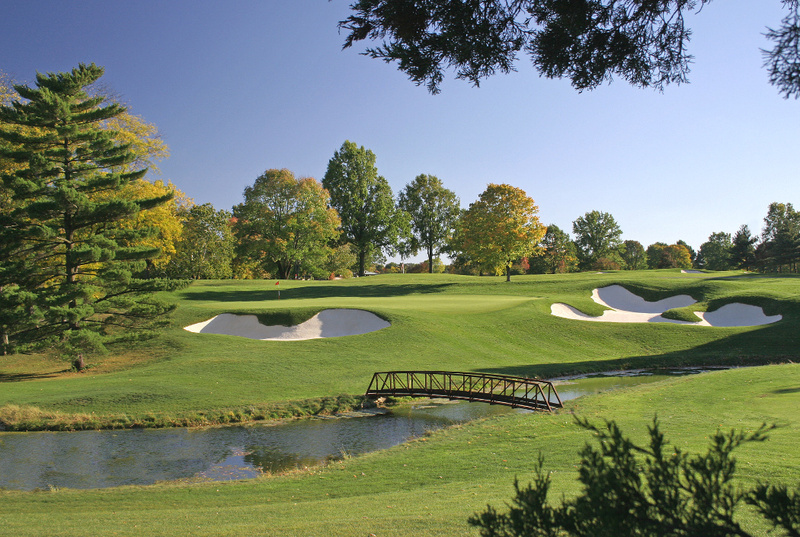 The second of the four Web.com Tour Finals events, the Hotel Fitness Championship, was contested on the Jack Nicklaus Signature Golf Course at Sycamore Hills Golf Club in Fort Wayne, Indiana. The players in this week’s Web.com Tour event on the Scarlet Course have amassed a combined 60 PGA Tour victories and 106 Web.com Tour titles. The field will compete over 72 holes of stroke play, with a cut to the top-65 players and ties after 36 holes. Alister MacKenzie, the architect of Cypress Point and Augusta National, designed Ohio State’s Scarlet course in 1931 but died in 1934, before ground was broken. Perry Maxwell oversaw the construction, which was completed in 1938. Ohio State alumnus Jack Nicklaus returned to renovate the course, concentrating on restoring the course to the way MacKenzie originally intended it to play. The Golden Bear’s improvements restored the bunkers and lengthened the course to 7,455 yards, and the par was changed to 71. The redesigned course was named to Golf Digest’s Best New Private Remodel list. The Scarlet Golf Club has also topped rankings of the best collegiate courses. This week’s Nationwide Children’s Championship benefits the Nationwide Children’s Hospital in Columbus, Ohio, with proceeds earmarked for pediatric cancer research and treatment. Nationwide Children’s Hospital is also supported by The Memorial Tournament, the Nicklaus Children’s Health Care Foundation, and the Nicklaus family. Since 2007, the tournament has raised $3.4 million for patients and families in the Nationwide Children’s Pediatric Cancer Program.